It's a Sunday and it's cold! But... I was lucky enough to have my youth crew come and help me paint the hall. Although I'm pretty sure they didn't do much! I started to notice after a while that you would tell them where to paint, they get bored, wander off, then go back and paint the same spot AGAIN! Hey all... So Day 10 seems to have come around amazingly fast... and I am absolutely shattered!!! Today was the first day that we started painting! I'm so happy because its starting to look clean. Week three and it heated up on So You Think You Can Dance. The dancers were paired up with dancers they hadn't worked with the previous weeks, and there were even more solo performances too. That means we're not going to look at all the routines except the hip hop duets and the routine of the week, otherwise it would take forever - by the time it would be done it would be Saturday and time for the next episode! To see the week three solo hip hop routines, click here. Conceptually this impressed me. Each week the bar is being raised in terms of creativity, and you might think "Oh, wow, a wall prop," but the choreography is what sets it aside, such as the connection the dancers have between it - 20 seconds in and I was laughing at the (assumed) reference to Birdgang. Technically this routine wasn't danced flawlessly as made obvious by the screen divided by the wall - imagine how it would look if it was. Outstanding moment: "B-boys and b-girls" lyric is where the breaking starts. It doesn't take a genius to work out why that's good: the elements of the music were being adhered to! This had so much Bird written all over it that it would have flown over (no pun intended) the heads of those who have never seen a Birdgang performance before. Group moments, good use of the solo dancers (Tommy and Mark both breaking) and just a good all-round piece, on many levels. Why is this routine of the week? Because once again Tommy manages to adapt to a style not familiar to him, and further to his credit as a dynamic dancer, he even went to a Cuban night club to learn more about the dance! That's commitment you don't see very often, which is why it was a shame he was voted as one of the bottom two. I was visited today by 'Chav' Sal and the 'Impersonator' Leon... watch the parody near the end!! I said it before in my report and I'll say it again - Dance2HelpHaiti was an event that should be remembered for being turned around the in the shortest time - and it showed the community that hip hop holds. Off their own backs (with the support of Sadler's Wells), Zoonation and Impact Dance set up a fundraising day for the victims of Haiti earthquake, and hundreds of people turned up. So many turned up, in fact, that the total amount raised stands at £2,458 (if you include those who donated online). What's more, the choreographers involved, namely Kate Prince, Simeon Qsyea and Kenrick Sandy, took time out of choreographing for next week's So You Think You Can Dance (SYTYCD) to be there at such short notice. Choreographers, when commissioned for big jobs such as SYTYCD, won't usually have a lot of time on their hands, considering the time they need to travel, teach and rehearse. Yet after a few phone calls appointments had been moved around and all were able to make the time to do the fundraiser. It made me think back to the Mr Wiggles Pioneers lectures where Wiggles and Billy Bizzness talked about this sense of 'community' in hip hop - well last Sunday was just that! Which is why I decided to ask: did Dance2HelpHaiti show the unity of hip hop dance today? "The fact that we had hundreds of people pass through today shows what it's all about," said Hakeem to us afterwards. "It shows you can fall back on the community. There is a community, they (you) can tap into it, it shows that people do care about other people." Further credit must be given to the dancer from Unity (and that's not a pun on the topic of this blog) who even reached out to our writer, Archie, who was watching as I took a class, and asked her how she was. It's stuff like that that brightens a person's day and shows how accepting people in hip hop are. After leaving were were discussing this and she said to me "Even stuff like today brings people together and shows community - asking a complete stranger how they are." I said "That's not just being polite. That's hip hop." If your hip hop or street dance teacher isn't teaching you about the hip hop community or its history, find a new class. Read the Dance2HelpHaiti report here. I felt like a rubbish disposal man today - to and from the skip! #newmusicmonday Free download - Pretty Lights - "Sunday School"
Pretty Lights is the musical vision of Colorado based producer Derek Vincent Smith, accompanied in the live setting by drummer Cory Eberhard. Pretty Lights' first two albums, Taking Up Your Precious Time and Filling Up The City Skies have been downloaded over 300,000 times from his website, which equates to over 6.15 million track downloads. Sunday School is a great introduction to Pretty Lights' sound, where mashed up strings and vocals come together over a fat saw wave bass. With a couple of guest rap vocals over some precision drum programming this track works on or off the dance floor. 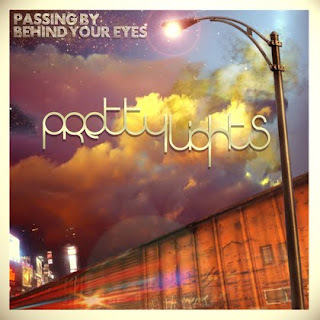 Pretty Lights returns with his new album Passing By Behind Your Eyes which is available for free download here. The album continues in the vein of Sunday School, juxtaposing collages of vintage samples against backdrops of futuristic synthesis and dirty broken beats, The sound is not only getting around, it's spreading like a virus. The most fun today was had by Leon and Dad who got the best job of smashing up the toilets. Realised I had to get some outside lighting... so cheap lamps coming soon!! Hehe! The first weekend at the studio and it's starting to look tidy. I know. Wow! Some of the youth crew came to help scrub the graffiti off the walls today and we quickly realised that it isn't going to happen any time soon! Back to the drawing board me thinks! Finally got people in to take some of the rubbish away and damn, was there a lot! Introducing the Alter Ego Dance Studio Renovation series of video blogs! This the second day in studio as I didn't have the camera on the first day so the video diary starts here! There was a lot of mess to clear up and I have been working flat out morning to night to get it cleared up! Joined by the family, Bengy (my doggy) and a crew member or two we got loads done! There is going to be a video being posted daily, so please watch this space and join me on this venture to get the studio open! Fingers crossed that it goes to plan! Here are the YouTube videos from week 2 of So You Think You Can Dance covering the hip hoppers, Lizzie Gough, Mark Calape and Tommy Franzen doing different styles, as well as the non-hip hop dancers doing hip hop routines. Outstanding moment: Turns to the floor and air freeze, 53sec. Originally in the behind-the-scenes footage, Tommy expressed he feared he wasn't pulling his weight enough in this routine. Considering Tommy's dance training, though, things didn't look so bad. The introduction as he walks on stage had swagger, and the smoothness of his hips was enough to woo judge Arlene Philips and establish a reputation of a lady's man! How much it looked like the choreographer I don't know, as the footage isn't available, but it was enough to fool the punters. Although the routine centred around the girl character, Tommy provided the support and pulled off the lifts perfectly. Terrible choice of music must be noted - stop playing up to the audience, especially by choosing a talent show winner's song for another talent show. Outstanding moment: Floor spin 1min 26sec. This is another routine that proves that Mark Calape really wants to prove he can do more than just street dance. It's only week two, but already he's managed to blag a traditional style of dance by jumping into the character of a regal and proud Viennese dancer with strong, fluid arms and confident movement. Lizzie Gough, who has been classically trained, would play the character of the noble sweetheart going to the ball with him. Despite a broken finger (a "blinger," bandage complete with diamontés) he was able to execute lifting her without any visible pain and dance the entire routine with a smile on his face. His "isn't that a kind of biscuit?" about the Viennese waltz will go down in dance history. Kenrick, choreographer for Boy Blue, choreographed a killer routine reminiscent of some of his work for Pied Piper for Latin dancer Yanet and contemporary dancer Robbie, but they weren't quite able to nail it. At first glance its okay as a duet, but as it moves on to the solos you see they're not quite as strong as individuals. Credit has to be given to Kenrick for squeezing in a six step into the choreography, although he should have really drilled Robbie's Zulu spins! Okay, I realise this isn't hip hop (and who said it had to be? ), but it was the most outstanding routine of the week. Choreographed by Rafael Bonachela it was moving and told a gripping story of two lovers. To favourite a contemporary routine says a lot for someone who doesn't usually like contemporary. Watch it and be humbled by it. If you'd like to see Bonachela, he is coming to the Artsdepot, Finchley in February, click here for more information. You can leave your comments below! Also check out our other SYTYCD blogs and fan us on Facebook for more street dance updates! After the storming success of The Last Skeptik's Marina and The Diamonds 'Mowgli's Road' Remix, getting BBC Radio One play from Huw Stephens and Rob Da Bank, and included on the front page of The Fader.com, Skep has done it again, showing the world precisely why he is fast becoming a sought after commodity for remix japery. 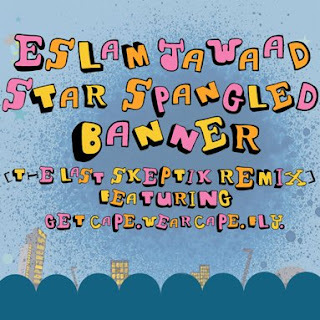 Taken from Skeptik's forthcoming CD entitled 'Same Day Different Sh*t' , 'Star Spangled Banner' sees Skep remixing Damon Albarn affiliate Eslam Jawaad's new single, featuring brand new vocals from Sam Duckworth, better known as indie sensation Get Cape. Wear Cape. Fly. Moving from big guitars and nasty hip hop drums, to an almost drum and bass laced, heavy hook - this is a perfect taste of Skeptik's varied production. Entirely composed of remixes, (with all accapellas provided by the labels, management or artists themselves) 'Same Day Different Sh*t' also features reworkings of songs by: The Streets, Marina and The Diamonds, Daniel Merriweather, The Game, Get Cape, Loudmouth Melvin, Mongrel, Joe Budden and Lowkey. As an acclaimed DJ and producer, The Last Skeptik has worked with the likes of Sway, Get Cape. Wear Cape Fly., Jehst, MF Grimm and Kyza to name a few, and is currently in the studio working with The King Blues. 'Same Day Different Sh*t' will no doubt imprint Skeptik's unique production style in the minds of the masses, building anticipation for his highly anticipated, forthcoming ominous instrumental epic. Lizzie Gough is the only female street dancer on So You Think You Can Dance. She's also the dancer I knew the least about, but with a little bit of résumé searching I managed to find a few facts you might not know from reading not-so-great BBC So You Think You Can Dance profiles. Lizzie is in the show Blaze at Peacock Theatre in March - click here to buy tickets! As with other dancers we've done for our So You Think You Can Dance blogs Tommy Franzen and Mark Calape, I'll be going along with the "haven't I seen them somewhere before?" theme... it works best for me and helps along the dawning of "I thought I knew her!" moment we all get when we recognise someone. And her résumé shines! Besides the street dance, over the past eight years she's scooped up a great selection of appearances as a commercial dancer in front of big audience: The Royal Variety Show, the X-Factor tour, and Clothes Show Live, and of course the all-star names she's danced for go with those shows, plus worked with commercial dance groups, Rudeye and Dance2XS. Her most recent job has been dancing for Take That at the Brit Awards. Like a lot of the dancers taking part in So You Think You Can Dance, she trained at Laine Theatre Arts. But because street dancing is our angle, we want to know about her credentials! First up, she is a b-girl, as she was part of the Oxfam internet viral campaign raising awareness for pregnancy healthcare. She can lock, she can pop, and Lizzie Gough (aka Lil) has also worked with Plague dancer Mukhtar Omar for George Sampson's music video (listen with the music down...). Still not sure where you recognise her? You will if you've ever stepped into a night club and heard Fedde Le Grand's Put Your Hands Up. Further to her appearance in So You Think You Can Dance, Lizzie will be performing alongside Tommy Franzen this summer at the Peacock Theatre in Blaze. Make sure you check it out when it comes round, as we'll be covering it for our hip hop theatre section of the main site! You can comment below! Also, if this is your first time visiting our blog, don't forget to fan "Too Much Flavour" on Facebook! 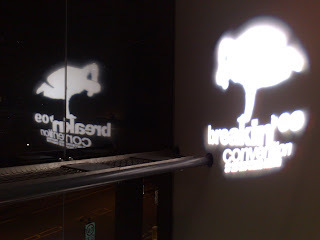 Submissions for Breakin' Convention 2010 are closing next week - Friday 22 January. For any dancers or crews that haven't yet submitted their application there is only a little time left for a chance to apply to appear in the annual sell out hip hop theatre festival at Sadler's Wells. If you think your dance group has the innovation to make it on stage, for more information, to read the guidelines and to enter, go to the Breakin' Convention 2010 submission page. For an idea of the kind of originality Breakin' Convention team is looking for, read our review of Breakin' Convention 2008 and Breakin' Convention 2009. Tickets are now available for Breakin' Convention 2010, and they've done away with unreserved seating. This year there's the option of having a seated or standing ticket, with a price difference of £5, which is worth it if you've ever returned to your seat and found a stranger sat between you and a friend! There's more ticketing information on booking for groups of people and theatre day passes here. The event is always a sell out, so don't put off buying tickets until the last minute. Buy Breakin' Convention 2010 tickets here. 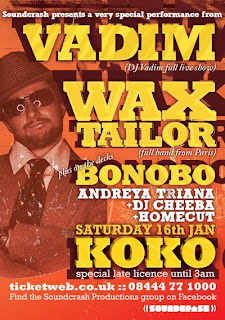 Award winning, chart topping French trip-hop/hip hop producer Wax Tailor will be bringing his extraordinary show to London with a full live band, headlining KOKO alongside an exclusive full live set from the ever fantastic DJ Vadim. Support from Homecut, Bonobo and Andreya Triana make this the first of many unmissable gigs from Soundcrash in 2010! 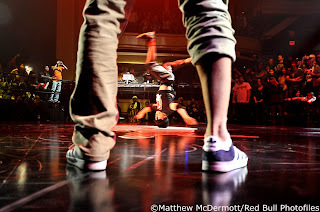 Last November Red Bull BC One took place back in the home of hip hop, New York City. I remember that night well. I was up until the early hours following the results to write this news report. Phil Waddell, international relations student by day and b-boy by night won the competition, and got to see B-Boy Lilou battle B-Boy Cloud in the final for the former to take the title for the second time. A few weeks later we tracked down Phil on Twitter where he actually linked us to his report. It's taken this long and a reminder from Red Bull to get round to posting it, so thanks to Holler for the prompt. Big respect to Phil for winning. In fact, he even stated that TooMuchFlavour was an inspiration for him to give writing a go - thanks Phil! 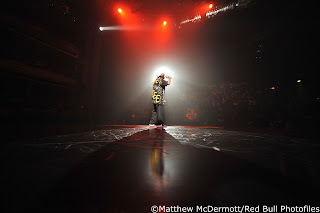 Stepping out of a yellow taxi in New York City, outside the Hammerstein Ballroom, the location of the 2009 Red Bull BC One, the first thing I hear is the music coming from inside the venue; it’s Jay Z’s “Empire State of Mind”. Add this to the fact that I’m here in the USA for the first time, and about to take my seat ringside at one of the most prestigious B-boy competitions in the world and you can see why I suddenly get butterflies in my stomach. I make it inside and take my seat just in time to see the competitors take to the circle for the introduction, sixteen of the world’s best, picked for their uniqueness and dedication to B-boying, and definitely deserving of the deafening applause from the crowd. It’s certainly emotional for everyone here. The sixteen competitors form a ring running around the circle; standing in the middle is our MC for the evening, a certain KRS-One. It’s a powerful scene. KRS-One, the man who is hip hop, surrounded by the latest and greatest ambassadors of B-boying, united where it all began. Our DJ for the evening is DP One, a New York resident and B-boy. If anyone knows the beats to spin this evening, it’s him. B-Boys to the circle. The battles commence. Read the rest of the report at the Red Bull Reporter website here. Tommy Franzen and Charlie Bruce "The Bench Routine"
Tommy and Charlie's routine had some moves that reflect Simeon's style in the choreography with plenty of 'and' counts, although considering Charlie's main style isn't hip hop, reproduction of it was a little under par (but not bad considering - if Simeon can turn around JLS' talents, think what he can do with a developing jazz dancer). With a bench prop the routine worked well to include levels, a meeting point for the dancers, as well as a stage to pull off moves, which worked to Tommy's strengths as a b-boy. Of both hip hop partner routines, I preferred this one. A big NO to the choice of song, considering Take A Bow is so often a sending home song on X Factor! I wasn't feeling Kate Prince's routine last week in the choreography camp, considering it was labelled 'hip hop' when it was actually a) not to a hip hop song, and b) a fusion with hip hop styles but not specifically hip hop - don't be misled. The style of the routine (lyrical hip hop) was a wink in the direction of her Into The Hoods production, which included full props and costume, with big smiles and jazz hands. Both Mark and Lizzie performed the routine as it was intended to look, although it was nothing they wouldn't have been capable of, so it was a lucky pairing of styles and dancers. Lizzie and Tommy are both starring in Blaze at the Peacock Theatre in March - click here to buy tickets! What did you think? 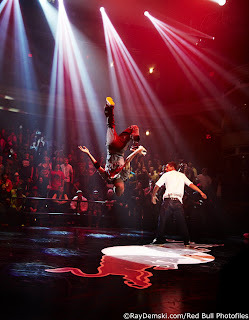 Which do you think was the better hip hop routine on So You Think You Can Dance? You can comment below! Mark Calape (Swarf Mafia) quick bio and videos - So You Think You Can Dance? Mark Calape is the dancer on So You Think You can dance I believe people will want to know about the most about. Mark Calape, aka Swarf Mafia is one of the Animaineax, whose group profile is really high since winning Move Like Michael Jackson, and our site statistics reflect their popularity at the moment! I met Calape briefly last January at Funk Physics' We-R-One celebration after the main show to commend him on the group's original set. He was very humble about it all and he told me Animaineax had a lot in store for 2009. He wasn't wrong about that! The way he picks up the different layers of the music when choreographing is what makes Calape, and indeed the Animaineax stand out, and is probably due to his "dance is a feeling, not just a routine" mantra. As a choreographer, Calape is very fortunate to get to travel the world to teach, judge and battle. Better yet for his fans, he's a keen YouTuber, cutting together videos of his adventures for people to watch. The video below shows him travelling Estonia, Korea, Vietnam, and others. It also has the début of the Man In The Mirror routine from Move Like Michael Jackson. Let's get this out of the way too, ladies: Calape is a proud father, as you can tell how he signs off the above video. His background in dance includes being the guy behind the dance group Pink Mafia (you can see him rocking the shirt in some of the videos), although before this he danced with a group Culture Shock Dance Troupe (I picked up that fact here), part of iDance. Calape has also danced with a lot of the major street dance companies like Boy Blue in their Pied Piper tour last year, and a run in last season's Into The Hoods as well. The music video résumé is healthy too. His most recent appearance included Jay Sean's Down video with Lil Wayne. It's been watched 29 million times, but you can probably spot Calape in one. We believe its his relaxed attitude and quirky persona that will make Calape popular. Although he's out of his comfort zone in anything that isn't street dance or breaking, he's fared well so far in styles he's not trained in. 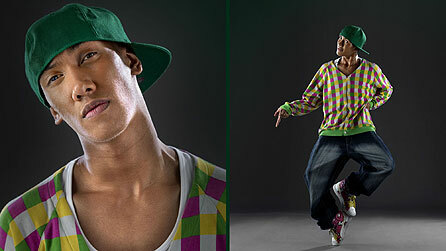 Same as with Tommy Franzén, being a street dancer we wish Mark Calape the best of luck in So You Think You Can Dance. If you're that way inclined, you can 'fan' him on Facebook here. You can comment and share your thoughts about Mark Calape below, or share this page on your social network. Also, if you linked over from Mark's fan page, don't forget to 'fan' us too, so we can keep you up to date with hip hop and street dance news and more! Hey! Did you click over to us from TommyFranzen.com? Be sure to check out our other blogs on Tommy and So You Think You Can Dance and don't forget to fan us on Facebook for the latest in hip hop and street dance! Tommy Franzen is a good guy, and he's also going to be one of the contestants (competitors?) on BBC's So You Think You Can Dance. I won't pretend to know Tommy Franzen personally, but I did meet him briefly at the Breakin' Convention Pioneers workshops in October and had a chat. Which incidentally was the same day a representative of the BBC was walking around and handing out audition flyers to people at Sadler's Wells. I was there when the decision was made! Tommy is appearing in 'Blaze' at the Peacock Theatre in March - click here to buy tickets now! Originally from Sweden, Franzen learnt hip hop from David Johnson in his home country with his sister. A lot of people will know Franzen because of his breaking, but fewer know that he has a National Diploma in Performing Arts, or that he's a qualified massage therapist. He studied at the Urdang Academy where he gained his experience in contemporary dance which later saw him turn down the opportunity to be in Cirque du Soleil. If you want to see more videos of Tommy Franzen, check out his YouTube channel. So You Think You Can Dance on is on BBC1 tonight at 6pm. To watch his audition video and see him talk about the show, you can visit his profile on the BBC website. You can visit Tommy Franzen's website at tommyfranzen.com which is currently under construction. His YouTube channel is live though, where you can watch more videos of his commercial appearances or check out the music video he shot for a friend's birthday. You can also 'fan' Tommy on Facebook to show your support, if you're that way inclined! As a street dancer, we'd like to wish Tommy Franzen the best of luck in So You Think You Can Dance. Update: Tommy Franzen will be performing as part of the cast of Blaze at Sadler's Wells from 11-28 March, click here for more information. Note: We know Tommy Franzén has an accent over the e, but if we put it in, people wont find this page when they Google us! Move Like Michael Jackson is due to move on - to Holland and Belgium. Here's we were thinking that the UK would be the exclusive hosts of the talent show to find the dancers who would represent Michael Jackson at his tribute show in June. In a news update after the Move Like Michael Jackson final from Mark Summers last week, it was announced the show would be moving to Holland and Belgium to audition for more dancers on TV channel SBS6. The show will run over nine weeks compared to BBC3's week-long run. From what we can make out from translations (not confirmed), this time Lavelle Smith Jr will be promoted to judge, sitting alongside Jermaine Jackson. Timor Steffens, one of the dancers on the This Is It tour, has been announced as another judge. Will the judges need to learn Dutch, will the Dutch audience have to learn English, or will they have translators? You can visit www.movelikemichaeljackson.nl for more information. If you don't speak Dutch, try the crudely translated version with Google Translate. If we find out any more information we'll keep you posted with any developments.